This catalog provides an overview of National Dam Safety Program publications and resources available to the public. Each resource is listed with a short description, its cover image when available, and an icon for its availability. Many of the resources are available online and can be ordered from the publications warehouse. National Dam Safety Program: Dam Safety in the U.S.
As the lead Federal agency for the National Dam Safety Program (NDSP), FEMA is responsible for coordinating efforts to secure the safety of dams throughout the United States. The program makes Federal funds available to the States, which are primarily responsible for protecting the public from dam failures of non-Federal dams, and pursuing initiatives that enhance the safety of dams posing the greatest risk to people and property. There is great variance in the effectiveness of state dam safety programs. Although some of this variance may be appropriate as each state must address its dam safety needs and responsibilities in its own way, some state programs are not considered adequate. Many unsafe dams also have been identified and required remedial action has not been implemented. The Model State Dam Safety Program was first developed in 1987, updated in 1997, and updated again in 2006 to assist state officials in initiating or improving their state programs. The document outlines the key components of an effective dam safety program and provides guidance on the development of more effective and sustainable state programs to eliminate the risks created by unsafe dams. The Dam Safety Act of 2006 (Public Law 109-460) requires the FEMA Administrator to submit a report to Congress that (1) describes the status of the National Dam Safety Program (NDSP); (2) describes the progress achieved by Federal agencies during the two preceding fiscal years (FYs) in implementing the Federal Guidelines for Dam Safety; (3) describes the progress achieved in dam safety by States participating in the Program; and (4) includes recommendations for legislative and other action that the Administrator considers necessary. The objectives of Activity 630 are to encourage state dam safety officials to complete their inventories of dams; to encourage state dam safety officials to get the most dangerous dams repaired or modified to reduce the threat of dam failure; to encourage state dam safety officials to get EAPs completed for all dams that pose high or significant hazards to downstream residents; and to encourage communities to integrate dam failure planning into their emergency plans. Without logging into the website, you are able to obtain basic dam information by State including dams by hazard potential, # high hazards with EAP (emergency action plans), significant hazards with EAP, dams by height, primary owner type, primary dam type, primary purpose and completion date. So there is some information available without creating an account and logging onto the website. 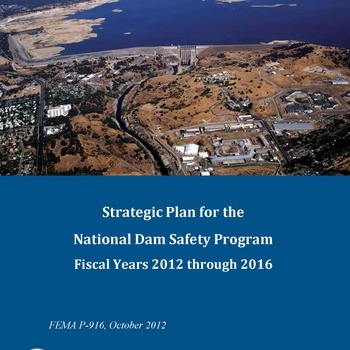 This report to Congress describes the achievements of the States, the Federal agencies, and their partners in Fiscal Year (FY) 2008 through FY 2011 in meeting the vision, mission, and objectives of the National Dam Safety Program. The final chapter of this report includes strategies for strengthening the Program. To encourage and promote dam safety nationally, FEMA coordinates with federal, state, and private sector partners through two advisory committees, the National Dam Safety Review Board (NDSRB) and the Interagency Committee on Dam Safety (ICODS). ICODS is comprised of representatives from several federal agencies having an involvement with dams and serves as the permanent forum for the coordination of federal activities in dam safety and security. The NDSRB, comprised of federal, state and private sector partners, advises FEMA’s Administrator in setting national dam safety priorities and considers the effects of national policy issues affecting dam safety. The NDSRB also helps monitor performance of state dam safety programs. For more information, visit National Dam Safety Review Board and Interagency Committee on Dam Safety.